your kids clamor to be next in line to receive this coveted award! Kids love them! At only about 4 inches tall, they're cute, cool, and besides the small size, look identical to the snap chip bags. Materials: Snack size chip bags, parchment paper, small blocks of wood, glue gun, cookie sheet, oven, and magnets able to withstand heat. Begin by collecting your chip bags (my students loved to help by bringing in used ones from home or from their lunch). I use the snack size in order to shrink down to the 3 inches, but I have seen the larger chip bags used. (I had a parent make me a large one at the end of one year-it is still my favorite teacher gift EVER) By using a full size bag, it will shrink, but will end up being about 11 inches tall. For this tutorial I will focus on the snack size. Chip bags on cookie sheet, inside of parchment paper "envelope"
Don't forget to get out any crumbs left in the bag-they won't shrink and will only cause havoc for your end result. Step 2: Fold in half a piece of parchment paper to make an envelope for the chip bags. Put the parchment paper on the cookie sheet. Place the chip bags inside of the parchment paper "envelope". While being careful not to place the magnets on top of the chip bags, surround them with magnets to hold securely in place. 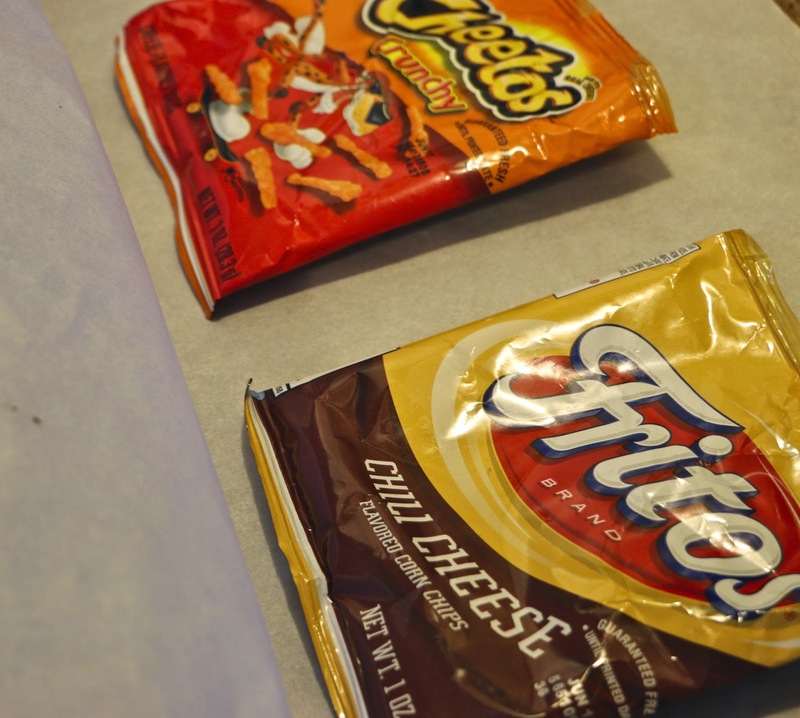 As the chip bags get hot, they will try to curl up. The parchment paper and magnets will keep the bags flat during the melting process. 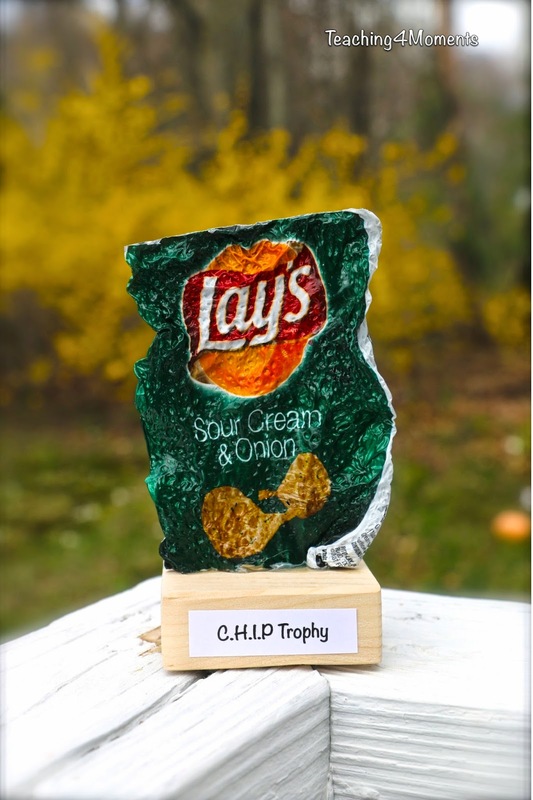 If you like the bumpier look of the CHIP Trophies take them out of the oven after 5 minutes. Every oven is different, so a little practice will be needed to get the look that you want out of the chip bags. Chip bags right out of the oven, cooling down. Step 4: Allow the Chip bags to cool for about two minutes before removing from the cookie sheet. It's also best to wait a few minutes before lifting the parchment paper to take a peek. A spatula will easily take them off of the parchment paper. The magnets will be hot, so be careful! Step 5: The chip bags may have a few poky edges. Trim them with scissors before the next step. Chip bag right out of the oven, waiting for a trim. 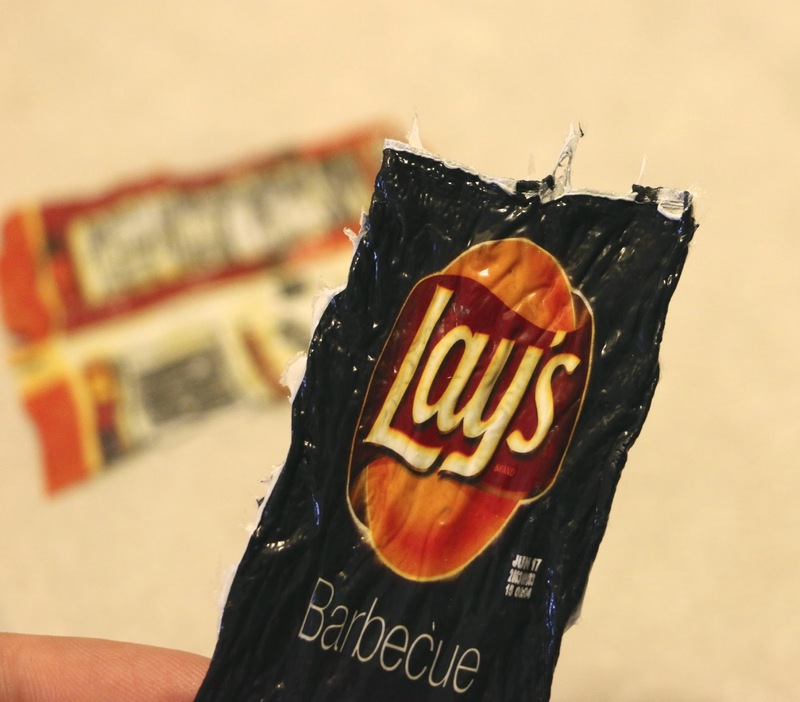 Step 6: Use any base you want to glue the chip bags onto. Be as fancy or simple as you want! These particular ones came from a left over project in our garage, but I've found them at Home Improvement and Craft stores as well. I've found my glue gun to work great for the trophies. As the glue dries, lean them up against something so that they won't fall over before the glue hardens. I used to use a Sharpie to write on these, but over the years it became easier to type up the labels and just tape them on. I also think they look nicer this way. I like to put what the Trophy stands for on the bottom, and the students name on the front or back. 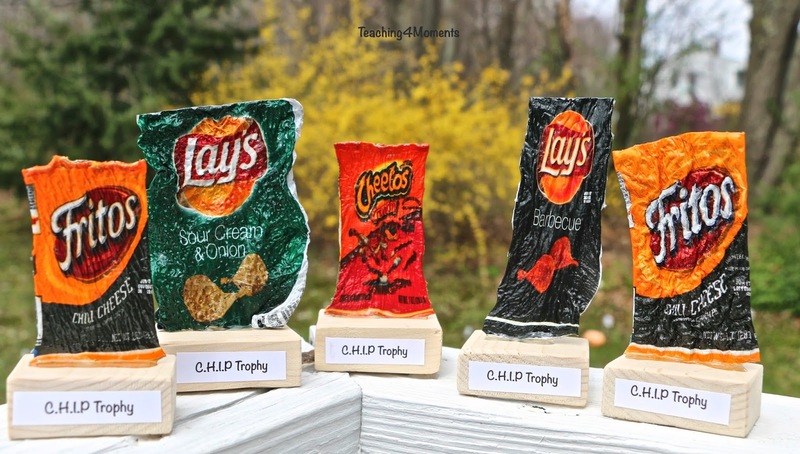 On a few occasions I've switched the meaning of our CHIP Trophies to work towards a different goal. Maybe one of these works better for you? What else can they stand for? 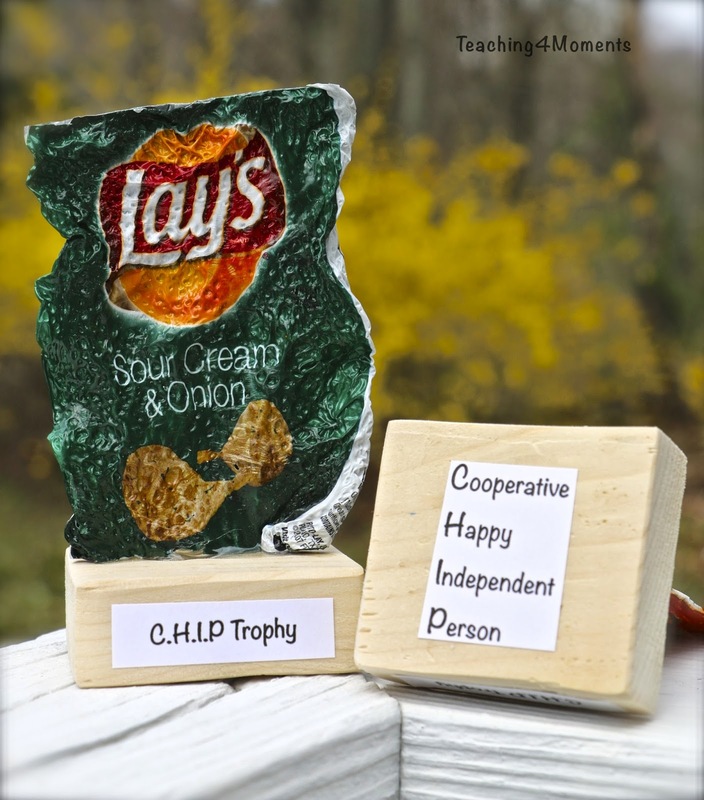 When I first learned about the Chip Trophies I was a first year teacher and promptly forgot who the source was. I came across them recently through Pinterest! The original idea came from Kris Thurgood and Kim Christopherson from ilovethatteachingidea.com Thanks for the great idea, ladies! 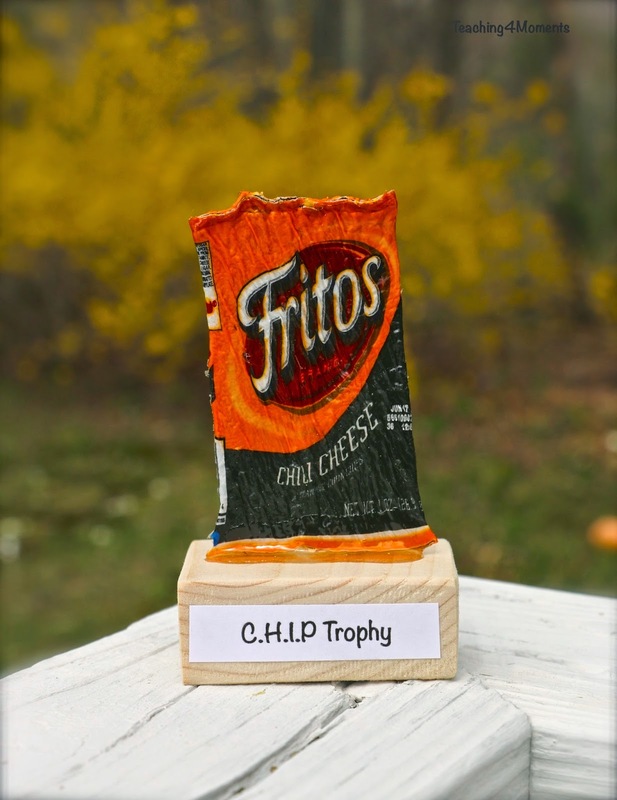 I love Chip Trophies! The parchment paper has been a GODSEND!! The original recipe didn't call for the paper and after years of trying different temperatures, and times in the oven, the parchment idea finally hit me. The biggest hurdle I was having was the fact that as they cooked, the edges wanted to curl up into itself. Sometimes they would flatten out on their own (depending on the temp), and other times I'd have to really try to flatten them to get the right look. Using the parchment paper and magnets, they aren't able to curl up while melting and makes these little puppies so much easier to make! One year I was invited to the home of one of my students for their annual "Teacher/Student Family Dinner" at the beginning of summer. 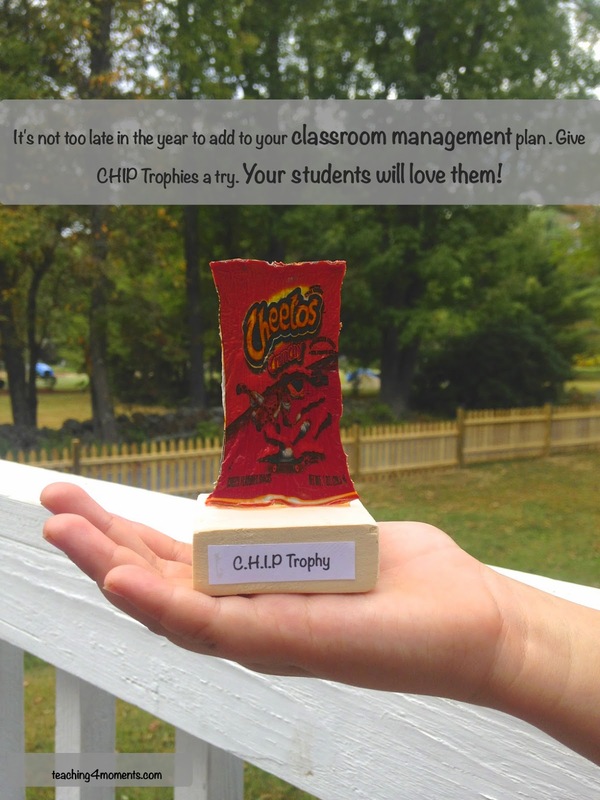 While I was there I was proudly shown my students row of CHIP Trophies that she had earned from me throughout that year. They were displayed prominently in the home and I will never forget how important and proud those trophies seemed to make her and her family feel. These trophies were worth every bit of effort and time on my part to make and award. Give them a try! I'd love to hear how your students respond to them.